Ever since my FMT post, I have received an endless stream of messages wanting to know how the heck I am doing! So, I apologize for not doing this sooner and leaving you all waiting with baited breath. It has been 10 months since my last FMT treatment! My gut symptoms have improved about 60-75%. I do get some bloating and abdominal pain occasionally , but not nearly as bad as I used to. I honestly think that my remaining symptoms are a result of some lingering thyroid issues. It feels more like a water retention bloating versus a gassy bloating (if that makes sense). I recently did my first post FMT stool test. I decided on the GI MAP tests, because it was recommended by my functional dietitian and it’s PCR technology appears to be more sensitive at detecting micro-organisms than culture based stool analysis. My test provided some interesting insights. First, my colon appears to be completely free of pathogens! My stool test in the September right before my FMT was a hot mess. Opportunistic bugs were overgrowing all over the place! My functional dietitian said she rarely sees stool tests as clean as mine (without any colonic pathogens). In addition, I had robust levels of health promoting flora like Lactobacillus and Bifidobacterium. So, my dietitian believes that my stool test confirms that the FMT was successful at rebalancing my large intestine dysbiosis. But, my stool test wasn’t totally scotch free. I did have high levels of H. pylori, the bacteria that is found primarily in the stomach. H. pylori has traditionally been labeled a “bad bacteria” due to its role in ulcer formation. But, recent evidence laid out by Martin Blaser in the book Missing Microbes refutes the long held belief that “the only good H. pylori is a dead H. pylori.” Research has shown that H. pylori is a natural member of our gut flora and actually can play a protective role in our health. While I had high h. pylori, I tested negative for the virulence factors. You can think of virulence factors as weapons that certain bacterial strains have that increase their ability to cause disease and become pathogenic. So, its good news that I don’t have a strain of h. pylori that was producing these factors! But, that left me and my dietitian scratching our heads as to whether we should treat this with antimicrobials or not. We also contacted the GI MAP people to get their two cents. They said that the h. pylori, while not causing symptoms could be lowering my stomach acid levels, which may be why my pancreatic enzymes markers were slightly low. Low stomach acid can also result in SIBO, which is something that also needed to be considered when choosing a treatment option. We decided to take a more conservative treatment route for now. We decided try some additional digestive support with enzymes while continuing to take my probiotic (MegaSpore) and consuming fermented foods. I am also taking some additional supplements to help support detoxification and to optimize my hormones. We are keeping some H. pylori killing supplements in our back pocket in case we deem them appropriate in the future. Overall, I think FMT has been a valuable tool at jump starting my recovery. It corrected my colonic imbalance and has relieved a lot of my symptoms. But, it is not a cure all! I still need to make tweaks to address the other root causes of my gut problems like hormonal disturbances, stress and h. pylori (low stomach pH) to continue to improve. Please follow the SIBO Diaries on Facebook to never miss a post! You can also subscribe to the mailing list! Please leave any questions or insights below! 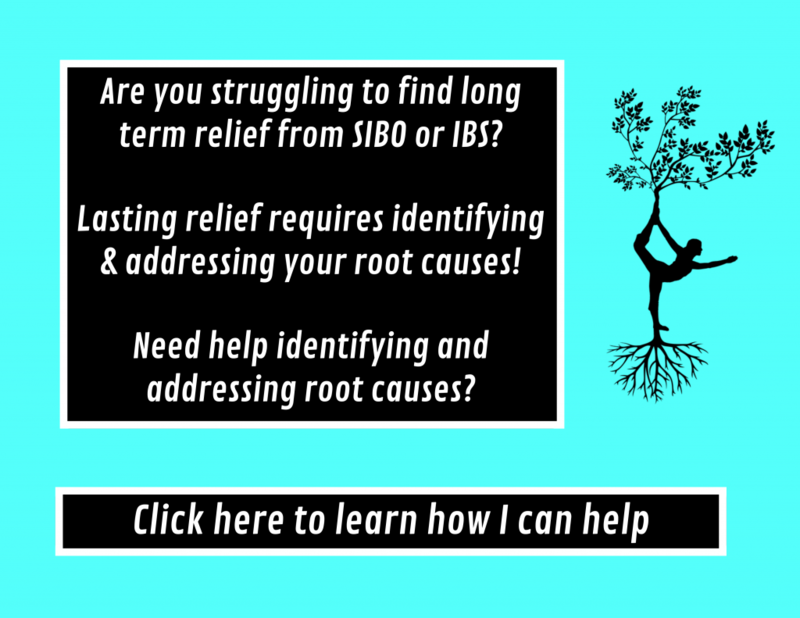 Are you sick and tired of SIBO/IBS holding you back? Do you want to break free from your chronic GI symptoms? I can help! Contact me to set up a free 20 minute consult! Previous Previous post: Why you shouldn’t ignore weight loss during SIBO treatment? Got Die-Off? What it really means and how to avoid it! As one of the probably many people who messaged you about the FMT, I’m really happy to see that you’ve made this post! It’s great that you’re feeling better and as a reader and somewhat of a fan, I’m really happy for you. Since you suspect that your current bloating is due to hormonal issues, are you supplementing with iodine? I’ve heard that supplementing with Lugol’s iodine works wonders for certain women during/post SIBO treatments. If not, I’m curious to know what steps you’re taking to address these thyroid issues. Also your blog is awesome and you seem really awesome. Hi Alma!!! Thanks so much for reading and the kind words! I have tried iodine and it didn’t really do much for me to be honest. It raised my TSH slightly and didn’t increase my T3 or free T3. Iodine is one that you have to be careful with since it can cause increasing inflammation if you do have hashimotos. I think it may be helpful to detox from fluoride or bromide toxicity. I get my iodine from my diet at the moment. I do drink reverse osmosis filtered water which removes fluoride to help my thyroid function. My low thyroid hormones appears to be a brain issue and not an issue at the thyroid gland itself. I have been meditating to help my brain and to reduce HPA axis issues. We have also hypothesized that I am still struggling with some chronic mono that is effecting my thyroid a little, so I take some immune support and antioxidants for that too. Hopefully, I can get my thyroid numbers up soon! I hope that was helpful!! Thanks again for the kind words! I blushed! Hi Michelle, may I know what preparation you did in the year before? I’m looking for anything I can fix, or things I might have overseen. Amy thank you for your blog! Hi Michelle. I too am currently considering the Taymount Clinic in the Bahamas for FMT. My conference is coming up next week. I’d love to hear what you have done before your FMT to prep. I’ve had my symptoms under control for quite some time w/diet although my most recent SIBO test was still positive. We think b/c of the low stomach acid and lack of enzymes. I was taking one or the other, and not both. Did you also have Leaky gut? If so, was that resolved before or post FMT? Thanks for the advice. I’m so happy to hear this! I’m scheduled for FMT Bahamas in Feb 2018, as is my 10 year old daughter. We both have SIBO, have tried several rounds of antibiotics, and are currently managing symptoms with a low Fodmap diet, bovine colostrum, and probiotics. I also have pretty severe histamine intolerance, and am hoping to address that in the weeks pre-FMT. Thanks for giving us hope! Oh wow!! That should be an amazing healing and bonding experience for you and your daughter! Everyone at the clinic down there is awesome so you are in good hands! You should check back in and let me know how it goes! Did FMT help with your situation or your daughters SIBO? I’d love to learn what kind of prep you did prior since I’m down that path for FMT this July. One of my docs has had 4 chronic SIBO patients get an FMT at the Taymond clinic. The doctor reported that 3 have been cured and 1 had no response. Do you know if they screen donors for methane bacteria? Also, is it true that the price tag is around $10,000? Hello! Can you share what digestive support you use to counteract any pylori activity? I used the supplement Super Enzymes by NOW brand. Hi Amy– how are you feeling now that you’re a few more months out?? Thanks so much for these updates– I’m now going to get mine in March and I’m so hopeful!! Hi Amy. Just watched your video posted on 5/7/18 and have read many of your blogs. Thank you for sharing! I am in the process of working w/the Taymount Clinic in the Bahamas for FMT. Can you elaborate on what you have done before your FMT to prep? Although I’m doing everything that I can, I’m afraid that I’m not doing enough to financially invest in my upcoming July FMT. I’ve managed my symptoms for quite some time w/low FODMAP diet and avoiding all leaky gut sensitivity foods (i.e. Cyrex 10 & Elisa/Act). We know my stomach acid is low and am recently taking both Enzymes and HCL & Pepsin. I was taking one or the other previously which is why I believe my SIBO has returned. I’ll be starting on a round of biofilms and natural antibiotics to treat the SIBO this weekend hoping to eradicate if not rid most of the bad bacteria. Hi Cheryl!! I actually didn’t do tons of prep right before the FMT, because I had already taken care of my SIBO. I tested negative in September before I received my FMT in December. I had done antibiotics and vagus nerve strengthening exercises to keep my small intestine clear of the beasties. FMT should help with leaky gut by providing the necessary bacteria that promote tight junction protein activity along the GI tract such as Bifidobacterium. These good gut bugs are crucial to repairing leaky gut. Eating different fibers with your FMT can also ensure that the bugs are growing, your mucosal barrier is producing mucous to protect the lining and that your gut lining remains strong! The Taymount clinic and the folks at the Bahamas branch are great resources too so make sure you ask all the questions!! Best of luck and keep us updated! They didn’t have different prep methods when I went. I basically drank a ton of the powder laxative and also took dulcelax. I believe I drank it with coconut water. The power was out during my prep at my hotel which made the night especially exciting! Best of luck with your treatment! Thank you for the response and well wishes! Ugh – a power outage on prep night sounds awful…I can’t even imagine. I wanted to quickly follow up with you and see at what point “die off” symptoms evolved into improvements for you? I finished treatment a week ago and everything feels so much worse than before now. GI-wise and also with emotions, etc. Clinging to success stories like yours to keep me sane, so anything positive you can share would be 100000% appreciated! :-). Thanks again!